Learn how to bake delicious bread machine cinnamon rolls, which go well for breakfasts, brunches, and snacks. 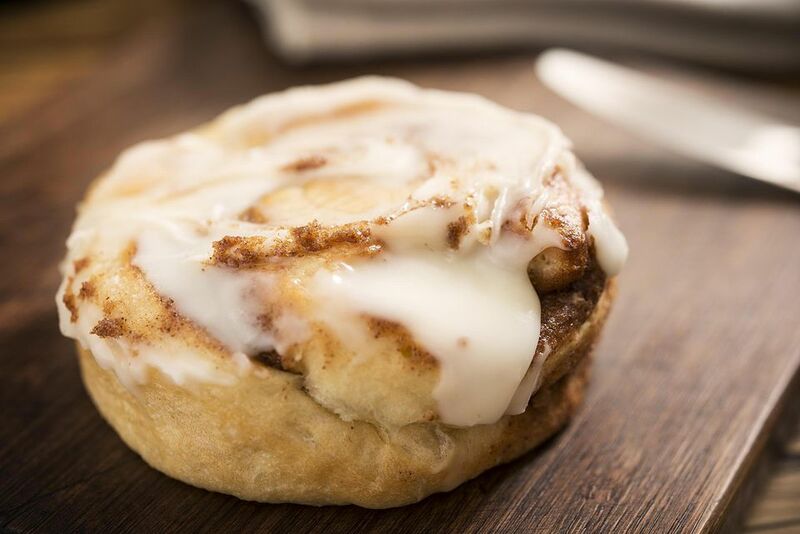 This recipe for bread machine cinnamon rolls relies on your breadmaker to make the dough. From there, you will shape it, cut it into rolls and bake it off. Finally, the sugar drizzled frosting goes on so they are sweet and have a frosting texture. Add the ingredients for the cinnamon rolls to your bread machine as recommended by the manufacturer. Program the appliance for the dough cycle. Let the dough be kneaded and produced. When the cycle is done, place dough onto a floured surface. Knead the dough for about one minute, then let it rest for another 15 minutes. Next, preheat the oven to 375 F.
Roll the dough out into a rectangle, about 15 by 10 inches. Spread 1/4 cup of the melted butter over the dough to within one inch of the edges. Then sprinkle 1/4 cup of sugar, cinnamon, nutmeg, and chopped nuts evenly over dough. Roll the dough up tightly on the long side. Press edges to seal and form into a 12-inch long, evenly shaped roll. With a knife or 8-inch-long piece of dental floss, cut the entire roll into one-inch pieces. Place the rolls cut side down into a greased 13-inch by 9-inch baking pan. Cover it and let it rise in a warm, draft-free place until it doubles in size. This part of the baking process will take about 30 to 45 minutes. Bake the rolls for about 20 to 25 minutes, oven for 20 to 25 minutes or until golden brown. Cool the rolls in the pan for 10 to 15 minutes. Drizzle them with the powdered sugar icing. To make the icing, combine 1 cup of powdered sugar with 1 to 2 tablespoons of milk and a 1/2 teaspoon of vanilla. Blend the mixture until it is smooth. If too thin or too thick, add more powdered sugar or milk, respectively, until desired consistency is reached.